A month-and-a-half of work, 656 screenshots on Xbox, approximately 43,000 layers in the livery tool… and he wrote and performed the music as well! 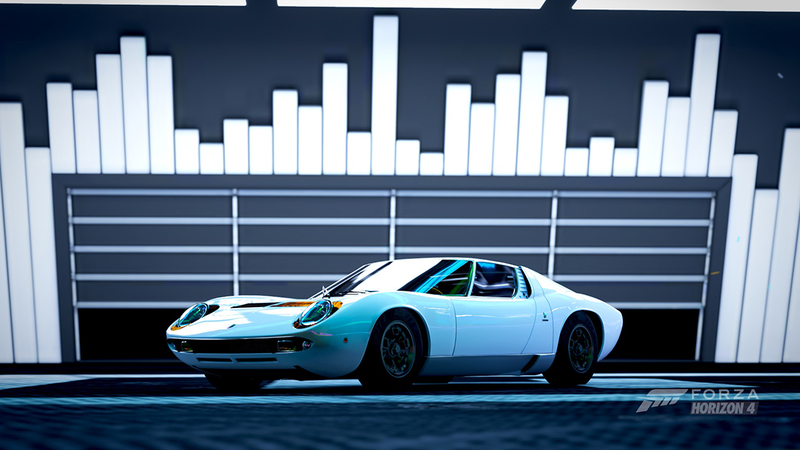 Congratulations to PTG FOX on a newly minted Forza community classic! Fall is here in Forza Horizon 4, which means a new mix of events to make your way through in the game. Open up the Festival Playlist and you can see everything that’s available to you this week (along with the winter and spring seasons yet to come in Series 7). 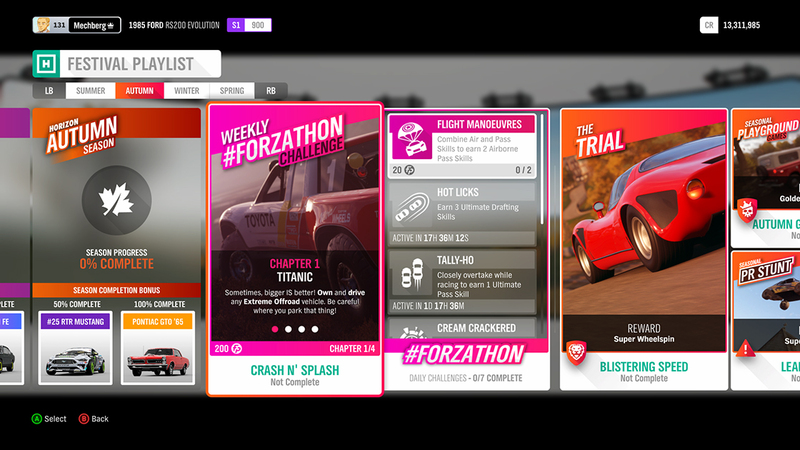 Between the Crash N’ Splash weekly #Forzathon challenge where it’s all about Extreme Offroad action, and the ongoing Season and Series completion challenges, there’s something for everyone. In the Autumn Season, there are two new cars available to pick up, including Vaughn Gittin Jr.’s #25 RTR Mustang as well as the 1965 Pontiac GTO. A word about completion percentages for these Season and Series reward cars. After listening to community feedback, Playground is currently testing an update that will lower the completion percentage from 100 percent to 80 percent. The 50 percent completion percentage will stay the same for rewards but the updated completion requirements will back date. So, for example, if you got 83 percent completion in the summer season, you would receive the Porsche 914/6. Look for this change to surface in the game as early as next week. How’s your drifting looking this month? Between the new drift cockpit camera and the new RTR cars, there’s no better time than now to practice getting your favorite cars sideways. Even doubly so because of our ongoing Drift Bounty Hunter event, where you can pit your drifting skills against the likes of Team RTR pros Chelsea DeNofa and Vaughn Gittin Jr. (GTs: ChelseaDeNofa and VGJXX5, respectively), as well as Turn 10 developers Aaron Brooks and Devin Carraway (GTs: Euro Nation and SpaceLionDC). The current world #1? That would be JSR AziDhk, who has posted an astonishing 102,370 points on the Dubai Mountain Circuit as of this writing. Can you beat that score? Maybe not. More likely than not, however, there’s someone on your Xbox Live Friends leaderboard that you can knock off. So find the “Drift With the Pros” event under the Featured Events Rivals channel and get to sliding! 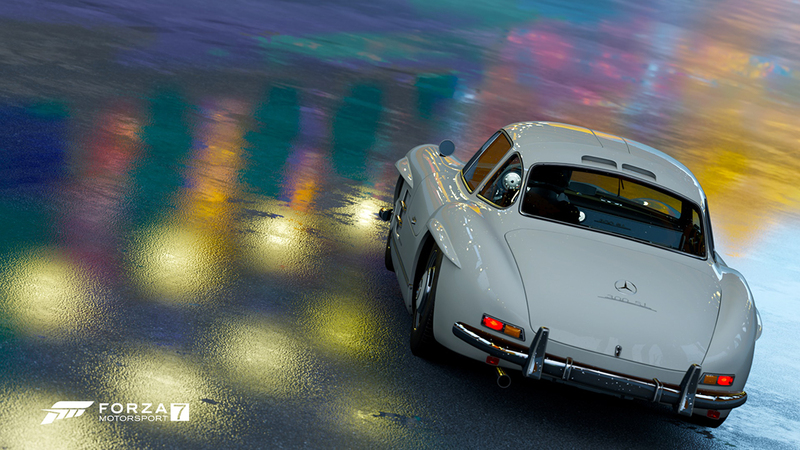 Forza weekly photo contest winner by holden88805. Forza weekly photo contest winner by QuickSloth10237. If you missed last week’s edition of #ForzaFriday you missed a great conversation with Forza Motorsport design director Chris Esaki. Today we’ve got another fun Turn 10 guest lined up – senior developer Mike Grodin, who will be making his first appearance on Forza streams. We’ll be chatting about Mike’s role at Turn 10 and playing Forza Motorsport 7 with viewers, so make sure you’re around to get in on the conversation, ask questions, and join in on the racing fun. It all begins at 3 p.m. Pacific on the Forza Mixer and Twitch channels. 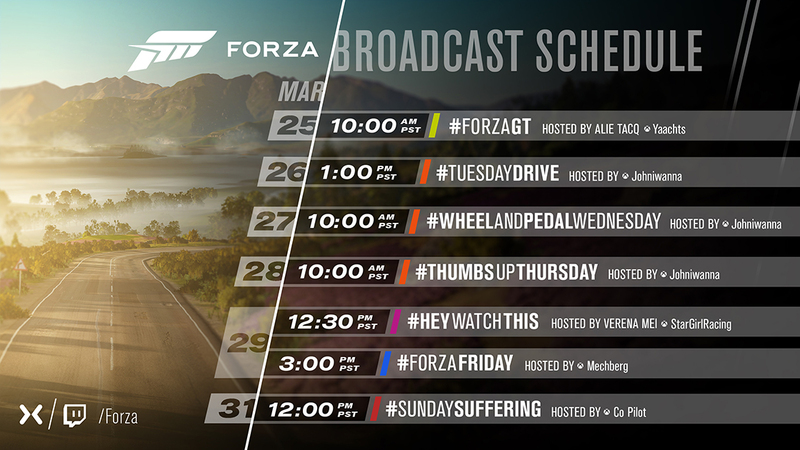 Before we head out for the weekend, here’s a look at what’s upcoming next week on the Forza channels, including the debut of our new Sunday show featuring our very own Co Pilot, who will be taking viewers along on her journey towards "git gud" status in Forza. The adventure begins with "Sunday Suffering," debuting on Sunday, March 31!